Infrared photographs are a stunning way to make unique landscape photos, and will add variety to your portfolio. Understanding how to take and process them properly can be very difficult and time consuming due to the steep learning curve involved, but I hope to help. In this two-part tutorial, you’ll learn about the infrared choices available, how to take infrared photographs using a filter, process your photographs to a high standard and avoid any common mistakes along the way. Let’s begin. Infrared (IR) is a challenging form of photography. When going through this tutorial, you need to be very methodical about the process of setting up your equipment and taking the shot. It would be a good idea to print out some notes to take with your when shooting as there is a lot to think about, and it can easily go wrong. I have created a handy checklist for you to print and fold up into your bag. If the light is dimmer, this means your camera can still capture IR, but it means your exposure times will skyrocket due to your camera having a strong internal IR blocking filter. If your camera does not have live view, set a long exposure, start taking the shot, and point and press buttons on the remote towards the lens. The resulting picture should show the red tinted light. If you do not see anything from the remote, this means your camera cannot capture IR, and cannot use this tutorial to effect. There are a few offerings available when it comes to infrared filters. There are both screw in types from brands such as Hoya, and square filters from Cokin, for example. Screw-in filters are a great way to make infrared photographs. They are, however, relatively expensive. My advice is to buy a well-known brand to get the best results. I purchased a Hoya R72 and I'm impressed by the results, although they sell for around $100+ for the larger sizes. Square filters offer the advantage of being able to slot in and out quickly. While these work fine, the risk of the shot being ruined from light leaks is much higher than a screw in type. Prices range from around $60 for normal sizes. A handy tip is to buy the biggest screw-in filter you can afford, and use a stepping ring so it can fit on all your other lenses without having to buy a new filter for each lens. A Hoya 720 IR filter. 720nm is considered standard IR. I believe it is best to start off with this wavelength. There are others available such as 900nm models (RM90), but the prices of these are astronomical. I have seen them going for around $300+. These are reserved for serious IR photographers with deep pockets only! There is another option for IR photography if you do not want to use a filter. You can have your DSLR converted permanently to capture the IR spectrum. This can be done by sending away your camera and a lens to be calibrated. It is very expensive, and leaves your camera only able to shoot in IR. Check out www.lifepixel.com for a lot more information on this, as there are many options available. One of the most popular IR genres is landscape photography. Because of the effects of IR, foliage can be rendered pure white when processed, making photos look eerie, and have a haunting sense about them. Example subjects to experiment with include trees, flowers and grass. Ideal conditions for IR photography are a bright sunny days, rendering (when false color processed) skies a deep blue and foliage a bright white. That doesn’t mean that you can’t get brilliant results on overcast days. With the longer exposure times available to you with the IR filter fitted, results will be similar to a Neutral Density (ND) filter, giving a strong sense of motion to the photograph. It is up to you to experiment, so don’t be limited by these example subjects and situations! Certain lenses can produce abnormalities when shooting in IR, namely hotspots. When looking at an image, a bright, discolored ring can be seen in the middle of the photograph when it has been affected. Other issues can occur such as streaks over the image. These can be minimized is post-production, but are a real pain to deal with. Currently, there is no truly comprehensive list to show what lenses work well, and what lenses produce hotspots, but DPAnswers have produced a respectable guide on a number of popular lenses to help you see what lenses could cause you problems when shooting. Read the list of known affected lenses here on dpanswers.com. Let's move on to the process of shooting an IR image. Setting up the camera is an important step in the process to getting great IR photos. Do not attach the IR filter until you have completed the necessary steps, including focusing, exposure and white balance. First, set up your camera on a sturdy tripod. Put your camera bag on the hook of your tripod to add extra weight and minimize movement. Shoot RAW: Shooting RAW allows you to easily alter the white balance in post-production without any problems clipping colors. Shoot in uncompressed RAW so you get the most bits possible. This will give you greater flexibility when processing later. Never shoot JPEG, otherwise when processing images, noise and clipping will become more apparent. Turn off long exposure noise reduction: Because of the long exposures involved in IR photography, turning off long exposure noise reduction will mean no in-camera noise processing, resulting in no lag when the shutter closes. This also means you can finely tune the strength of the noise-reduction later. Turn on exposure delay mode/use mirror lockup: Turning on exposure delay mode or using mirror lock up will make sure vibrations from the mirror are minimized when you release the shutter. Remote release/self timer: Using a remote release is optional, but will further reduce vibrations as you will not be touching the camera when you release the shutter. Alternatively, you can use a 2 second self-timer if you do not have a remote. White balance is an important part of getting a decent IR image. You can use a pre-set value, or you can use Pre-White Balance to capture the White Balance in the current conditions. Either way, you will need to alter it in post-production to get any desirable results. Using preset White Balance values is fine. Incandescent is the coolest preset available. Taking a pre-white balance reading from a subject when on location is even better. Because IR will make foliage under sunlight white, this is what the white balance target will be. Select ‘Measure’ and press OK.
Make sure in the viewfinder, the subject is mostly green. A good idea is to aim for a patch of grass. Take a shot, and wait for your camera to report back. It will either say ‘Data Acquired’ or ‘Gd’. 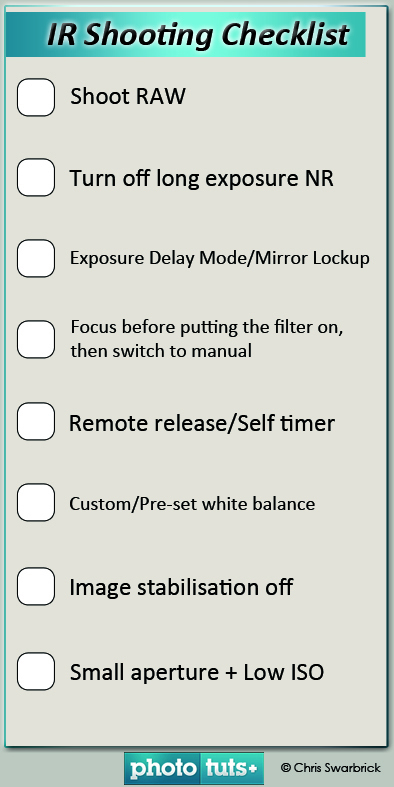 If the camera flashes ‘Unable to acquire’ or ‘No Gd’, then make sure you expose properly. The resulting exposure will be heavily tinted red/magenta/orange. This will be corrected later in post-production. Focusing is a difficult part of IR photography and can be a bit hit and miss in some respects unless your lens has IR focusing marks (Usually a small red nib, or on older lenses, a longer red line). It is best to use a narrow aperture, such as f/20, to ensure a large depth of field and minimize focusing issues. If your lens does have IR focusing marks, focus manually, and adjust accordingly to focal length. If your lens does not have IR focus marks, it is pretty much impossible to focus properly without a bit of a trick. One of the best things you can do is to set a small aperture to ensure you have a large depth of field. This little trick will make sure your shots are sharp, but it does mean you cannot use wider apertures for shallow DOF effects. Without converting your camera to permanent IR and sending your lens away to be calibrated, there is nothing else that can be done to achieve consistent focus at wider apertures. However, feel free to experiment. First focus and compose on your subject as normal with Autofocus. Then switch to manual focus. If you have a lens which has a rotating front thread, be very careful not to move it! Make sure any image stabilization systems are turned off. VR/IS/OS is not required because the camera is on a tripod, and also because the lens will try and make adjustments when not needed, which could result in a blurry photo. Focusing screen and VR logo. One of the most important settings in your exposure setup is to use a small aperture. This is not only great for landscape shots, giving you a larger depth of field, but it also minimizes focusing issues as explained in the focusing section above. Notice the large depth of field. Next set the ISO. Generally, it is best to use as low an ISO as possible to minimize noise. Taking into account the length of the exposure, I would recommend a maximum of ISO 800 for shots between 10 seconds and 1 minute, and a maximum of ISO 400 for shots over 1 minute. Any greater than these values and you will risk of having copious amounts of noise and hot pixels in post-production. Sometimes however, this is unavoidable. Also remember that going from ISO 100 to 200, for example, will half the time you are waiting for an IR exposure. So an 8 minute exposure at ISO 100, can be a 4 minute exposure at ISO 200. Only a slight increase in noise will be noticeable and it’s a good idea if you are pushed for time! Hot pixels when zoomed in. The last setting to choose is shutter speed. At first it will be an experimental process to determine exposure time. Most often you will need bulb mode, so be sure to bring a stopwatch! IR filters are dense and force slower shutter speeds, in the same way as ND filters, so you can calculate the amount of stops you need to compensate for by using an exposure calculator/chart, or you can work it out for yourself. So for example, if your visible light exposure is 1/30th, ISO 100, f/11, and your best resulting exposure in IR after experimentation is 1 second, then you know your filter is equivalent to a 5-stop reduction in light. Finally, you can screw the IR filter to the lens/stepping ring. Be careful not to adjust any settings or accidentally nudge the focus ring. You are ready to take the shot, so go ahead. Press the button, and await the results. Be sure to read the second part of this tutorial tomorrow to learn how to process your images! My name is Chris and I am a student in the UK. I am a currently at university studying for a degree in Interactive Digital Media and have a passion for photography.